Eggs are not an ideal mate for wine but mimosas do the trick. 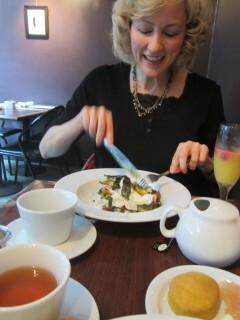 For MacLean, eggs are a stomach-filler needed for drinking. The Eater: Natalie MacLean is Canada’s best-known wine writer and self-styled “wine cheapskate”. She is the author of Unquenchable: A Tipsy Quest for the World’s Best Bargain Wines, which was recently awarded a Taste Canada food writing award for the best English-language culinary narrative. This was probably the first time the Oz Kafe server was asked which sparkling wine was used in the mimosa (answer: Prosecco). 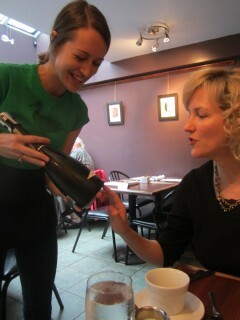 As she sipped her first Mimosa and smiled contentedly, she explained that it’s no coincidence that the orange juice and bubbly cocktail pairs nicely with eggs: MacLean says that the bubbles act as a palate cleanser to help resolve the mouth-coating issue while the juice adds a bit of sweetness. Some people believe the fattiness and protein content in bacon and eggs battles against a hangover, but MacLean claims her “extensive research” on hangover remedies has proven that nothing really works. By ordering her second mimosa, I believe she was hoping to demonstrate the so-called “hair of the dog” theory in which a hangover is alleviated by further alcohol intake. It's true. 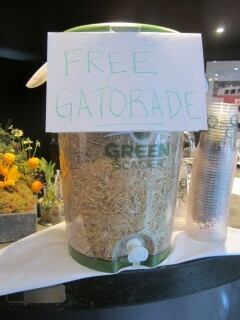 At Oz Kafe's Hangover Brunch there's a dispenser of free Gatorade. The Analysis: Long before I met MacLean in person, I had seen many photos of her online and on her book jackets and was captivated by her striking beauty: curiously thick, golden ringlet curls, smooth as porcelain alabaster skin, cherry-stained lips — all characteristics of femininity from another era. I wondered if her deliberately girlish look was the product of marketing and air-brushed photography or if indeed she would look like a vintage Shirley Temple doll in person. She does. And something about the softness and innocence of the way she looks doesn’t quite connect for me with her razor quick wit, her life of world travel and fierce ambitiousness. It feels like a mask. In the interest of armchair analysis here, I tried to scratch beneath the surface over brunch, hoping the relaxed setting and some mimosas would lure MacLean out of her comfort zone. But in the parlance of PR, she never goes off message. We talked about the fact that MacLean is not a cook, but that scrambled eggs (one egg plus two egg whites, no salt) with applewood smoked cheddar is one of the two things she knows how to make (the other is spaghetti with sauce from a jar).